Hello Everyone! Thanks for stopping by! In case you missed my last "kid friendly" pizza post Banana Split Brownie Pizza be sure to check it out! 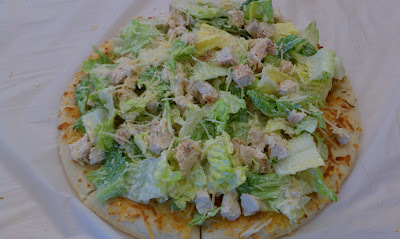 Today's recipe is called SALAD PIZZA! And boy is this good and as simple as it gets! 1. Spread the mozzarella cheese evenly over the pizza shell, add onion and garlic powder (as much or as little as you prefer) and place in the oven until the cheese is melted (follow directions on the package for cook time; should be about 8-10 mins.). 2. In a large bowl; toss the greens with the salad dressing, chicken and Parmesan Cheese. 3. Place the salad on top of the cooked pizza crust. Add more Parmesan Cheese. The entire process was complete in less than 45 minutes! 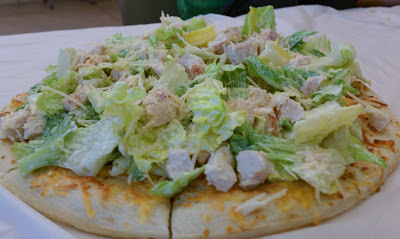 The kids had a GREAT time and LOVED the pizza! LIKE "Baking with Melissa" On Facebook! Check out my Kids Baking Party website here!